Softer compound of rubber of winter tyres, comparing to compound of summer tyres, shows better performance in low temperatures. Winter tyres have special sipe (tread pattern elements) technologies, ensuring good steerability not only on the snow or ice, but also on wet winter roads. Tread pattern of summer tyres is not conformable to snow and ice, as a result breaking distance of a car increases. We do not recommend using all-season tyres in winter. Between 1 December and 1 March, all vehicles with full weight not exceeding 3.5 tons, and sidecars thereof must be equipped with winter tyres! Use of studded tyres is allowed between 1 October and 1 May. Minimum allowed tread depth, provided for in Latvian legislation, is 4 mm for winter tyres. Remember – tread depth affects tyre functions! Marking "E" - tyre complies with EU or UNECE standards. 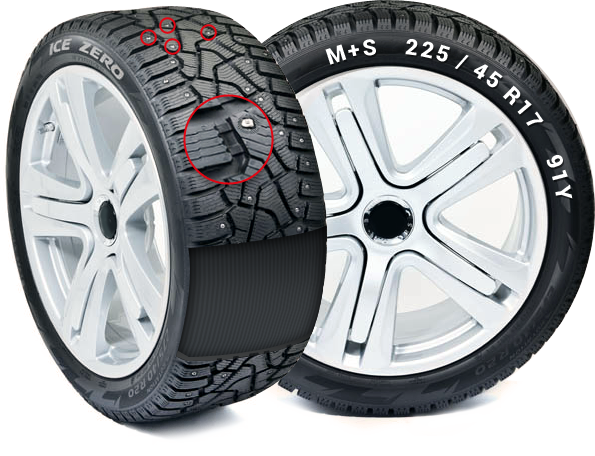 Figure indicated after the letter "E" indicates the country, which approved the tyre. Marking "S": level of noise produced by the tyre complies with EU or UNECE standards. Correct pressure ensures 100% tyre performance, even contact with road and wear. It is possible to specify recommendations on tyre pressure in car manual or on the sticker on the shell of the car, near driver’s door. Insufficient tyre pressure makes driving a car more difficult, and tyres get worn and hot to larger extent. For example, pressure decreased per 20 % reduces life of a tyre per approximately 80%. If pressure is insufficient, breaking distance of a car increases as well. Tyre touches the road surface only with middle of tread, thus increasing wear of central part of a tyre. Area of adhesion to road surface increases, thus negatively affecting safety.